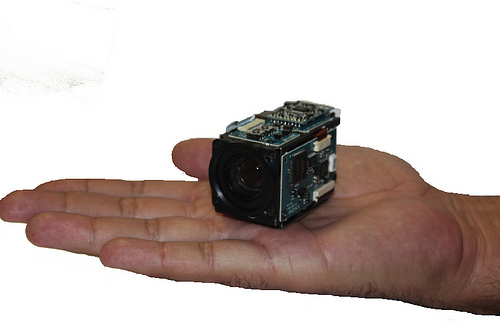 Machine Vision, Medical, UAV, Robotics, Remote Viewing, POV, and Many More! Hitachi’s KPHD20A – An HDTV HD-SDI camera for small spaces and superior performance. Considering upgrading your standard definition analog camera system to high definition? Upgrading from your analog camera to a tiny HDTV HD-SDI camera in just one step becomes possible with Hitachi’s popular KP-HD20A industrial camera. Equipped with a 1/3″ 2.1 megapixel CMOS sensor, and offering 1080p/30 and 1080i/60 video format with true 16 x 9 aspect ratio, and HD-SDI output all within one compact body size, the KPHD20A camera has become ideal for applications where space is limited but image quality demands are high. Unmanned vehicle applications are a prime example of where this camera’s capabilities shine. A high sensitivity of 0.3 lx allows your system to function in low light situations without having to add additional light sources while still delivering a high quality image. Full unattended imaging features including contrast and backlight compensation contributes to the ability of unmanned vehicles to operate with minimal interaction. For those needing more customizable settings, camera remote control is compatible with both RS232C and RS485 protocols. Offering both protocols also allows this camera to be easily integrated into new or existing pan/tilt/zoom/focus (PTZF) robotic systems. If you haven’t done so yet, consider replacing your analog camera with the Hitachi KP-HD20A as this HD model can use existing coax cables (up to 100m) to deliver a higher quality image to your system.